Across most of the U.S. and Europe, this is the season for basil, one of the herbs most revered by the Bravado Cooking Society. All Bravado chefs grow their own basil – it is a requirement. If you don’t grow your own, promise yourself that you will begin to do so next year. 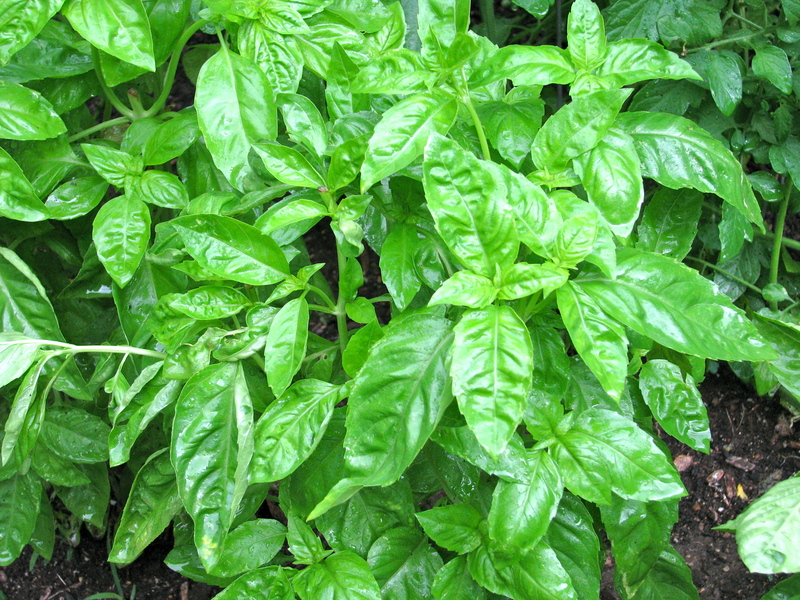 You can add fresh basil to almost any salad or even put it on a sandwich like lettuce. But, the best use, by far, is in pesto sauce. Put everything except the cheese in a food processor or “mini-prep” and puree for about 15 seconds. Pour into a small bowl and gently mix in the cheese. Y, voila. Now you are ready for some adventure. The most traditional way to use pesto sauce is over pasta. Spaghetti works fine, but try it over other pasta shapes likes medium tubes or bowties. These “catch” the pesto better. You can also buy or bake a nice, crusty baguette, slice it very thinly and spread the pesto sauce on top. Needless to say, this would be served with a nice white wine – maybe a Viognier for a change. If you are a true Bravado, you have to be willing to experiment. We did that last night and it was such a success, we have named it the “Summer Pesto Extravaganza” – and we discovered the whole thing by accident. A special thanks to son-in-law Andy (previously known in the Bravado world for his “Six-Pack Chicken”) who was the first to lead us off the beaten path. Here is how it happened. We were doing a marinated pork loin on the grill, we had thinly sliced new potatoes roasting in the oven and we had sliced tomatoes and corn on the cob – a simple but perfect summer meal. Little did we realize that the pesto sauce would make it a lifetime experience. I needed to harvest some basil. For those of you who cultivate this magical herb, you know that it starts growing like crazy in mid-summer. You cannot let the plant flower and go to seed since that sexual process makes all of the leaves very bitter. So, you spend your summer days trying to keep the plant celibate. A friend had once served pesto sauce with potatoes, so we decided to try that and quickly made a batch of sauce. As we began to eat – there were eight of us – Andy put some pesto on his pork. Wow, that was incredible so everyone tried it. Pork loin tends to be a little dry and the pesto works magic with it. We roasted the potatoes for almost 90 minutes, so they were crispy and they were also fantastic with the pesto. Then someone started to put pesto on the tomatoes. Before we knew, we had created the Summer Pesto Extravaganza. More later on some other things to do with basil. In the meantime, promise me that you will make a batch of pesto sauce this week and let me know what you did with it. Any clever new uses will be announced formally by the Bravado Cooking Society.